For those educated in a less digitized world, what constitutes plagiarism, and what does not, might seem fairly clear cut. But an article in yesterday’s New York Times notes that in an age where copyrighted intellectual property is available for the taking with the click of a button, and citing an original source can often mean digging through layer upon layer of tweets, re-tweets, blog posts, or RSS feeds, many students simply may not grasp the concept. From the Times: The Internet may… be redefining how students—who came of age with music file-sharing, Wikipedia and Web-linking—understand the concept of authorship and the singularity of any text or image. “Now we have a whole generation of students who’ve grown up with information that just seems to be hanging out there in cyberspace and doesn’t seem to have an author,” said Teresa Fishman, director of the Center for Academic Integrity at Clemson University. “It’s possible to believe this information is just out there for anyone to take.” So how does one go about avoiding the ignominious fate of the plagiarist? 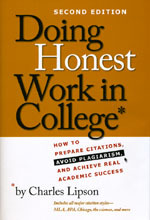 We recommend picking up a copy of Doing Honest Work in College: How to Prepare Citations, Avoid Plagiarism, and Achieve Real Academic . . .
How do you cite a T-shirt? The Chicago Manual of Style Online features a Q&A page, where the manuscript editors from the University of Chicago Press interpret the Manual’s recommendations and uncoil its intricacies. Our editors receive hundreds of submissions each month and a handful of the most helpful (not to mention entertaining) are selected for publication on the Chicago Style Q&A page. Occasionally there’s one too good not to reprint here: Q. How do you cite T-shirts? A. You could write, for example: Last week on Ellis Avenue I saw a T-shirt that said, “I keep pressing Escape but I’m still here.” That is, if you think it’s a good idea to cite a T-shirt. Anyone can post a question and access to the Q&A is free, so go ahead and ask all those hairsplitting questions about English grammar you’ve been dying to solve! While you’re at it, be sure to check out the loads of other free content like the tools for editors—a collection of sample forms, letters, and style sheets—as well as the Chicago Style Citation Quick Guide for help citing sources. Also follow the Chicago Manual of Style on Facebook and Twitter. . . . 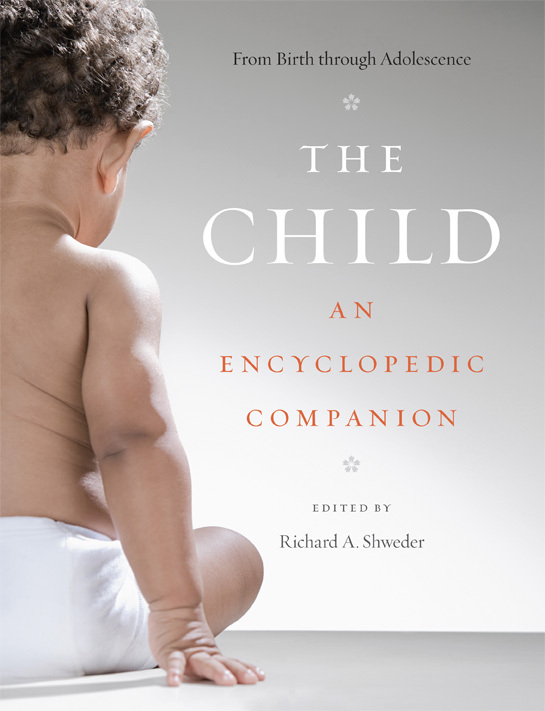 Probably the most comprehensive book on children ever conceived, The Child: An Encyclopedic Companion contains more than 500 articles written by experts in their fields covering, as editor-in-chief Richard Shweder remarks in this recent article, “everything you ever wanted to know but never even thought to ask.” Shweder continues: “we wanted it to be authoritative, balanced, clear, lacking in jargon and appealing to a very broad group—everyone from parents to grandparents to lawyers to pediatricians to educators to social workers.” And indeed with entries providing concise and accessible synopses of the topics at hand, alongside over forty highly readable “Imagining Each Other” essays that focus on the particular experiences of children in different cultures, The Child is the definitive resource for all who work with children. To find out more read the article on the website of the State Journal Register, or navigate to this special website for the book offering a video of Shweder talking about the book, sample articles, and more. . . .
Heidi Stevens wrote about The Child: An Encyclopedic Companion in last Sunday’s edition of the Chicago Tribune. 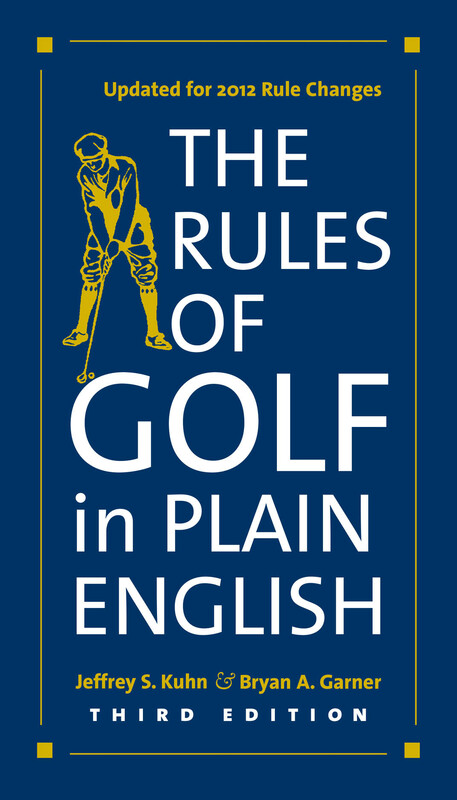 Stevens quotes editor-in-chief Richard A. Shweder who handily sums up the book: “It’s everything you ever wanted to know but never even thought to ask.” Everything in this case being more than 500 articles in a 1,144-page book that was 10 years in the making. Stevens also interviewed Mary Laur, senior project editor for reference books at the Press. A sidebar to the article notes five things learned from The Child, including this arresting fact: “Children in the U.S. are more likely to grow up with a pet than with both parents.” Sample pages, articles, and more is on our website for the book. . . .
WGN’s Milton J. Rosenberg recently invited several guests on his radio talk show Extension 720 to discuss the press’s recent publication of The Child: An Encyclopedic Companion—the definitive reference book for parents, social workers, researchers, educators, and others who work with children. Listen in as editor-in-chief Richard A. Shweder, contributor Sophie Haroutunian-Gordon, and house editor Mary Laur, talk about their new book and field questions from callers on the WGN Extension 720 website. Bringing together contemporary research on children and childhood from pediatrics, child psychology, childhood studies, education, sociology, history, law, anthropology, and other related areas, The Child contains more than 500 articles—all written by experts in their fields and overseen by a panel of distinguished editors led by anthropologist Richard A. Shweder—each providing a concise and accessible synopsis of the topic at hand. In addition to these topical essays, The Child also contains more than forty “Imagining Each Other” essays, which focus on the particular experiences of children in different cultures. Compiled by some of the most distinguished child development researchers in the world, The Child is an essential addition to the current knowledge on children and childhood. To find out more navigate to this special website for the . . . 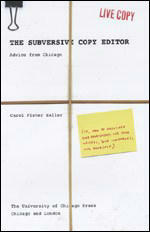 The Subversive Copy Editor “may be the best copy editor’s companion since the CMS, the AP Style Guide and that dog-eared xerox of copy editing marks you keep tacked up on the cubicle wall,” is how Publishers Weekly begins its starred review of the magazine’s Web Pick of the Week. And PW is in the majority opinion. An article in Sunday’s Chicago-Sun Times also is full of appreciation for Saller’s “conversational style and insights into interactions between writers and copy editors,” which “make reading her book an entertaining trip even for those who never plan to lift a red pen or use the editing feature of a word-processing program.” That might sound surprising: editing guide as beside reading? But it will make perfect sense to anyone who’s had a taste of the indispensably helpful and pleasingly witty advice Saller has been dishing out for years for the Q&A feature of The Chicago Manual of Style Online. . . . In his On Language column for Sunday’s New York Times Magazine, William Safire features Carol Fisher Saller’s The Subversive Copy Editor in a survey of new langlit. Applauding Saller’s “good advice,” Safire notes that “the editor of The Chicago Manual of Style Online‘s Q&A has written a book out of her Web experience, in contrast to those who take to the Web to blog-flog a book.” That said, Saller’s famous (among editors, at least!) online presence stretches from long before to, we hope, long after her new book’s appearance. But this is The Subversive Copy Editor‘s moment, and we, like Safire, can’t help but give her the last witty word: “There’s no end to the amount of fussing you can do with a manuscript, whereas there’s a limit to the amount of money someone will pay you to do it. At some point it has to be good enough, and you have to stop.” (Before we stop, though, we should point out that at our Web site you can sample and listen to Saller read from the book. And, if you happen to be in Minneapolis, Chicago, or Paris next month, you can hear her talk about the book in . . .
“Whereas, on his 445th birthday this April 23, Shakespeare still speaks to the people of Chicago through timeless words and works,” Mayor Daley proclaimed Thursday “to be Talk Like Shakespeare Day in Chicago”—much to the manifest delight of pun-loving reporters and headline writers across the country. But while the linguistic dexterity that gives us Da Bard is praiseworthy, it’s even more impressive to be able to pronounce Shakespeare’s lexicon correctly. That’s where Shakespearean voice and text coach Gary Logan comes in. In a book that was destined to have been published by a press whose hometown would eventually beget Talk Like Shakespeare Day, Logan aims to untie tongues and help anyone speak Shakespeare’s language with ease. 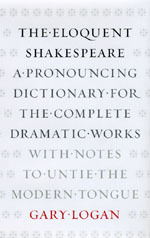 The Eloquent Shakespeare includes more than 17,500 entries, making it the most comprehensive pronunciation guide to Shakespeare’s words—and the best possible preparation for this Thursday in Chicago. . . .
Strunk and White’s Elements of Style turns fifty today, according to a story on NPR’s Morning Edition. It’s just a slim youngster compared to our burly and venerable Chicago Manual of Style, but the little volume has influenced the prose of many an undergrad. Is that something to celebrate? Writer and NPR guest Barbara Wallraff thinks so, giving approving notice to a “certain zen-like quality” about such famous maxims from the book as “eliminate needless words,” and “be clear.” But Geoffrey Pullum, professor of linguistics at the University of Edinburgh and a press author, begs to differ in an article today in the Chronicle of Higher Ed: Some of the recommendations are vapid, like “Be clear” (how could one disagree?). Some are tautologous, like “Do not explain too much.” (Explaining too much means explaining more than you should, so of course you shouldn’t.) Many are useless, like “Omit needless words.” (The students who know which words are needless don’t need the instruction.) 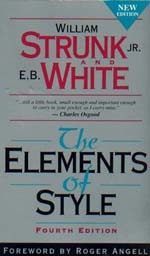 And more regrettable in a grammar guide, Pullum argues, the book’s toxic mix of purism, atavism, and personal eccentricity is not underpinned by a proper grounding in English grammar. It is often so misguided that the authors appear . . .